This macro will hide (blank) or show (unblank) all sketches (2D and 3D) in the active document using SOLIDWORKS API. 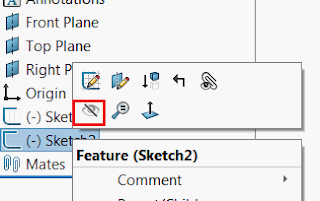 Change HIDE_ALL_SKETCHES option to specify if sketches need to be hidden or shown. Const SKETCH_FEAT_TYPE_NAME As String = "ProfileFeature"
Const SKETCH_3D_FEAT_TYPE_NAME As String = "3DProfileFeature"